This sturdy skid unit is constructed with heavy gauge steel side channels and heavy wood floor, overlaying a steel constructed frame, providing a quality skid unit at an economical price. The patented Dura-LIFE "Loaf" designed skid tank provides a very low center of gravity for stability in fork lifting and transporting. A recessed sump is molded into the tank for complete drainage. All units come complete with gallonage indicator, outlet fitting, fill lid, EPDM gasket and threaded vent plug for a positive seal. Econo Skid tank Unit 300 Gal. 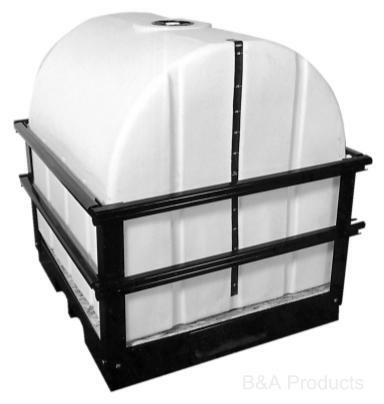 Econo Skid And Tank Unit -800 Gal. 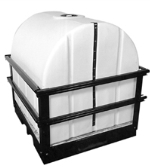 Econo Skid and Tank Unit -1200 Gal. Econo Poly skid Unit 210 Gal.